There are always more games played at Friday Game Night than appear in the schedule as many games will be "Bring and Play" (unregistered) games. To receive the Friday Game Night games list via email signup for the Email News Service. To receive notifications when this page has been updated, follow the Trumpeter Society on Twitter. Registerer your game for Friday Game Night. Send your game information to the Games Master starting the Sunday before Friday Game Night via the Email News Service. Games can be registered up to the morning of Friday Game Night. Friday Game Night October 5th: 78 people attended with 14 games presented. Bring-&-Play games are always welcome! Friday Game Night: November 2nd - 9 GAMES Registered with Room for more! PLAYER SLOTS: 3-8 players, 30min/player, roughly 2-3 hours. Giant plastic horrors and tiny cultists. D6 based combat, dudes on a map, building gates to Doom the Earth. The gates provide energy to pay for the next round and score victory points, in a race to 30 points, but you can't with your six spellbooks. These goals/achievements are something you'll need to do on the board which gain you your spellbook, providing new options for each one completed. The year is 3145. Khan Malvina Hazen of the Jade Falcons has decided to blood a heavy star against some of the Draconis Combine's best. The 1st Sword of Light has forces on the planet, and intends to defend it from this raid. Malvina has sent a star of all new mechs to test them and the warriors out. The DCMS has allocated a reinforced Lance to deal with it, also of their new tech. All materials provided, new players welcome. The party have finally caught the fugitive they were seeking for so long and have returned to Phlan. The city seems peaceful, but dark forces are stirring. Playtest a variety of original card games (and one board game) created by Lisa's game design students. There will be six games on the go, with interesting themes: dinosaurs racing around a track (the board game); thieves pulling off heists; Halloween trick or treating; spaceship battles; Medieval merchants trying to outbid one another; and an Exploding Kittens inspired game of pass the buck. 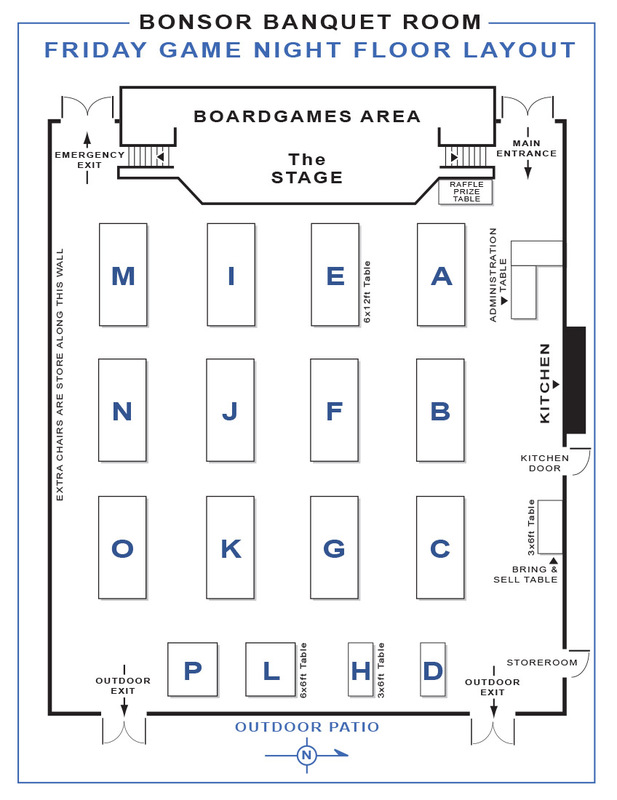 Lots of room for playtesters - please drop by our tables and give these games a try! August 1918. The German offensive has run out of steam. Now the Allies prepare to attack. Battle of Empress Augusta Bay, night of November 1 - 2, 1943. A Japanese fleet attempts to catch the Americans unawares and repeat the drubbing of Savo Island. TF39 has other ideas. It's a terrain-building game of exploring and looting a haunted house...until SOMETHING notices, and the Haunt breaks loose... Exactly what horror/challenge happens in the second half depends on which omen triggered the Haunt in which newly-discovered room. Playtime can be anything from about 30 to 90 minutes, usually c. 45-60. Multiple games are possible; it rarely plays anything even close to the same twice in a row. I won't be able to join in play myself until after the Door intake drops off at 9:00, but the game will be on hand and available from the time I arrive. Safely back at the Silver Eel Tavern... enjoying their wealth and fame, only to be rudely interrupted by screams from the docks... things never seem to change in Lankhmar! NOTE: Season Passes are now available but will only be offered until the end of January 2019. A Season Pass cost $55 for current society members or $60 for non-society members and gives you full paid admission to ​our annual tabletop games convention, Trumpeter Salute 2019 (all 3 days), and pre-paid admission to all Friday Game Nights. There is always more room for more games at Friday Game Night. Send your game information to the Trumpeter Society’s GamesMaster. More games will be posted here as more games are registered. ​NOTE: Anyone presenting a game at Friday Game Night receives a participation ticket and a presenters raffle ticket for the evening prize draw. Prizes include gift certificates from Imperial Hobbies as well as miniatures, game book and magazines. ​NOTE: Presenting games at the Trumpeters Club is open to both members and non-members. Send your game information to the Trumpeter Club's GamesMaster. You may also "Bring & Play" (ie bring a game to Friday Game Night without registering your game with the GamesMaster) but registering gives you a better chance of having other people playing in your game. Registering your game with the GamesMaster advertises your game.